For other uses, see Black Legend (disambiguation). A 1598 propaganda engraving by Theodor de Bry supposedly depicting a Spaniard feeding Indian children to his dogs. De Bry's works are characteristic of the anti-Spanish propaganda that originated as a result of the Eighty Years' War. Though black legends can be perpetrated against any nation or culture, the term "The Black Legend" has come to refer specifically to "The Spanish Black Legend" (Spanish: La leyenda negra) when not otherwise qualified, the theory that anti-Spanish political propaganda from the 16th century or earlier, whether about Spain, the Spanish Empire or Hispanic America, was sometimes "absorbed and converted into broadly held stereotypes" that assumed that Spain was "uniquely evil." The absorption of political propaganda and outright fabrications into mainstream academic interpretations of Spanish history, along with their use to conceal or sanitize inconvenient facts about other nations, resulted in a systematic repetition of such anti-Spanish bias and distortions. Commonly cited examples of this include the Spanish Inquisition and the relationship between Spanish colonists in the New World and the indigenous peoples of the Americas. Abroad our miseries are known and often exaggerated without balance: take as an example the book by M. Yves Guyot, which we can consider as the perfect model of a black legend, the opposite of a golden legend. The Spanish black legend is a straw man for those who seek convenient examples to support certain political theses (...) The black legend replaces our contemporary history in favour of a novel, genre Ponson du Terrail, with mines and countermines, that doesn't even deserve the honor of analysis [at the conference]. This conference had a great impact inside and outside of Spain. In Spain, the torch was passed to various historians making reference to the Spanish Black Legend, among them Julián Juderías. He was the first historian to describe and denounce this phenomenon in an organized way, providing the first definition of a black legend as well as the first description of "The (Spanish) Black Legend". His book The Black Legend and the Historical Truth (Spanish: La Leyenda Negra y la Verdad Histórica), a critique published in 1914, claimed that this type of biased historiography had presented Spanish history in a deeply negative light, purposely ignoring positive achievements or advances. An image of Spain circulated through late sixteenth-century Europe, borne by means of political and religious propaganda that blackened the characters of Spaniards and their ruler to such an extent that Spain became the symbol of all forces of repression, brutality, religious and political intolerance, and intellectual and artistic backwardness for the next four centuries. Spaniards ... have termed this process and the image that resulted from it as ‘The Black Legend,’ la leyenda Negra. The hypothesis of a Spanish Black Legend assimilating anti-Hispanic propaganda from the 16th and 17th centuries has a high level of acceptance among specialists, but the extent of its reach and the data it affected, and what may have actually occurred instead, is still debated, especially regarding the Spanish colonization of the Americas, where few written sources have been proven reliable. Historians are now exploring genetic as well as new scientific and statistical investigative techniques. There is also debate regarding whether the Spanish Black Legend is still in effect today. While some authors like Powell believe that the Black Legend continues to influence modern-day policies and international relationships, other authors, like Henry Kamen, believe it has been left behind. The Spanish Black Legend is said[by whom?] to affect most of Europe, especially Protestant and Anglican Europe, and France, as well as the Americas. There is, however, no significant trace of it in the Muslim world or Turkey despite the almost seven centuries of sustained warfare in which Spain and the Islamic world were engaged. There are no other core elements to the accusations of the Black Legend than those of being "the immoral other", whatever that might mean at the time the accusations are made. The accusations of mixed blood and loose religiosity of the 15th century were turned into accusations of religious fanaticism and Judaism in the 16th century, and of antisemitism in the 20th century. The only stable element is an element of "otherness" marked by interaction with the Eastern and African worlds, of "complete others", cruelty and lack of moral character, in which the same narratives are re-imagined and reshaped, as Margaret R. Greer and Walter D. Mignolo indicate in their work Rereading the Black Legend: The Discourses of Religious and Racial Difference in the Renaissance Empires. The self-criticism of the intellectual elite, which tends to be larger in larger Empires. The overlap of the period of splendour of the Spanish Empire with the introduction of the printing press in England and Germany, which allowed the propaganda of such colonial and religious rivals to spread faster and wider than ever before and persist in time long after the disappearance of the Empire. Permanence after the dissolution of the Empire due to religious factors. The dismantling and substitution of the Spanish intellectual class by another more favorable to former rival France following the War of the Spanish Succession, which established the French narrative in the country. The unique characteristics of the colonial wars of the early contemporary period and the need of new colonial powers to legitimize claims in now independent Spanish colonies, as well as the unique and new characteristics of the British Empire that succeeded it. In Italian anti-Spanish invective, the very Christian self-consciousness that had inspired much of the drive to purify the Spanish kingdoms, including the distinctive institution of the Spanish Inquisition, was regarded outside of Spain as a necessary cleansing, since all Spaniards were accused of having Moorish and Jewish ancestry. (...) First condemned for the impurity of their Christian faith, the Spaniards then came under fire for excess of zeal in defending Catholicism. Influenced by the political and religious policies of Spain, a common kind of ethnic invective became an eloquent and vicious form of description by character assassination. Thus when Bartolomé de las Casas wrote his criticism of certain governmental policies in the New World, his limited, specific purpose was ignored. As part of an Elizabethan campaign against Spain and the Catholic Church ...Literally hundreds of anti-Spanish publications appeared in English, Dutch, French, and German in the sixteenth century. New editions, and new works restating old accusations, would appear in the Thirty Years War and in other occasions when it seemed useful to excite anti-Spanish sentiment. Given the pervasiveness of such material, it is not surprising that the authors of scholarly histories absorbed anti-hispanism and transmitted it to later generations. Compounding this perception of Spain as an inferior ´other´ was the Black Legend, the centuries-old cluster of Protestant beliefs that the United States inherited from the British and, to a certain extent, from the Dutch. The Black Legend equated Spain with the Inquisition, religious bigotry, and the bloody persecution of Protestants and Jews. It also conjured up images of despotic monarchs who denied their subjects access to any semblance of economic and political freedom and who had consequently set Spain onto the road of economic weakness and political decline. Such a reading of Spanish history was overly simplistic but promoters of American exceptionalism found it useful to see Spain as an example of what would happen to a country whose fundamental values were antithetical to those of the United States. Anti-Spanish sentiment appeared in many parts of Europe as the power of the Spanish Empire grew. With the Habsburg realm, Spain dominated much of Western Europe (including present-day Belgium, the Netherlands, Luxembourg and most of the Italian Peninsula). In 1555, Pope Paul IV described Spaniards as "heretics, schismatics, accursed of God, the offspring of Jews and Marranos, the very scum of the earth". During the Eighty Years' War, English and Dutch propaganda depicted Spaniards as bloodthirsty barbarians. In the following centuries anti-Spanish stereotypes circulated widely, especially in English, Dutch and German-speaking parts of Europe. This propaganda would depict exaggerated versions of the evils of Spanish colonial practices and the Spanish Inquisition. Various reasonable origins have been suggested for the Spanish Black Legend. Sverker Arnoldsson, from the University of Gothenburg, supports Juderías hypothesis of the existence of a Spanish Black Legend in European historiography, locates the origins of the Black Legend in medieval Italy, unlike previous authors who locate it in the 16th century. In his book The Black Legend. A Study of its Origins, Arnoldsson cites studies by Benedetto Croce and Arturo Farinelli to affirm that Italy in the 14th, 15th, and 16th centuries was extremely hostile to Spain, and considers that the texts produced and distributed there were later used as a base to build on by Protestant nations. Just because the earliest writings against Spaniards were written in Italy, that is not sufficient reason to describe Italy as the origin of the Black Legend. It is a normal reaction in any society dominated by a foreign power. The phrase "black legend" suggests a certain "tradition", which did not exist in Italian writings based primarily on a reaction to the recent presence of Spanish troops, that faded quickly. In 15th- and 16th-century Italy there coexisted critics as well as Italian intellectuals that greatly admired Spain, especially Ferdinand II of Aragon. William S. Maltby further argues that the Italian satyre lacks the "conducting theme", the common topic and narrative that would later form of the Black Legend in the Netherlands and England. Roca Barea also protests this idea and, even though she does not deny that Italian writings may have been used by German rivals, the Italian writings "lack the viciousness and blind deformation of black legend writings", and are just satyric reactions to an occupation. In general, the Italian origin hypothesis is a good field to explore and read about the difference between a black legend and a simply negative view. Arnoldsson offered a second alternative to the Italian origin in its polar opposite, the German Renaissance. German humanism was deeply nationalistic and longed to create a German identity in opposition to the Roman invaders. However, both Ulrich of Hutten and Martin Luther, the main authors of the movement, combine the "Roman" in a wider concept of the "Latino, or "Welsche." This Latin world includes Spain, Portugal, France, and Italy, and is perceived as "foreign, immoral, chaotic and fake, in opposition to the moral, ordered and German." In addition to the identification of Spaniards with Jews, heretics, and "Africans" (see "anti-Semitic origin") there was a clear increase in anti-Spanish propaganda among the detractors of Emperor Charles V. The propaganda against Charles V was deeply nationalistic and identified him with Spain and Rome, even though he was Flemish-born and -raised, with origins in a German dynasty, and spoke little Spanish and no Italian at the time, and was often at odds with the Papacy. To further the appeal of their cause, rulers opposed to Charles focused on identifying Charles with the Pope, a view that Charles himself had started as a way to force the Spanish troops to accept involvement in his personal German wars, which they very much resisted as being none of their concern. The fact that the troops and supporters of Charles included German and Protestant princes and soldiers was an extra reason to focus attention on the rejection of the Spanish elements attached to them. It was necessary to create fear of Spanish rule, and to do so a certain image had to be created. At this point, the printing press would come into full action. Among the points most often highlighted was the identification of Spaniards with Moors and Jews due to the high level of intermarriage and the number of "conversos"(Jews or Muslims who had adopted Christianity) in their society, and with the "natural cruelty of those two." The actual level of intermarriage probably varied by region, being effected by length under Andalucian rule and Iberian Christian stigmas such as Limpieza de sangre. Additionally, the Reconquista which played a major role in creating Castile, benefited substantially from contributions both in soldiers and settlers from all over western Europe, including, but not limited to adventurers of German origin. Some authors maintain that various incidents with the troops of Charles V in Germany during the war contributed to development of the Black Legend, while others point out that although the majority of Charles's troops were German, atrocities were attributed exclusively to Spaniards, suggesting that the Black Legend already existed prior to these events. By the end of the 16th century, the Black Legend had acquired clear race-based elements under the influence of Flemish and French writers. By this time the power of Spain had also grown enough to threaten France´s security, and the Flemish nobles had given up all hope of extending their influence in the Castilian and Aragonese courts as they had initially tried to do (see the Revolt of the Comuneros). This created fear in France and discontent in the Flemish nobility, who saw their comparative power diminished and were repeatedly denied their desire to participate in the conquest of America (see following point). This origin combines elements of the German origin with the proofs of the anti-Hispanic narrative existing prior to the 16th century, and with the large number of parallelisms between anti-Spanish and anti-Semitic narratives in modern Europe, and it is among the ones that are gathering most support. Roca Barea, among others, argues that The Black Legend is founded on a spin-off, a reused version of the anti-Semitic narratives forged and circulated through England and most of Central Europe from the 13th century on. According to this view, the Spanish Black Legend was created by transferring the already created "character" of the "cruel, gold lusty Jew" onto the Spanish nations. Since the narrative was familiar, the stereotype accepted, and the identification of Spaniards and Jews was already mainstream in Europe due to the long history of coexistence between both in Iberia, at a time in which the Jews had been expelled from most of Europe, the Black Legend was proptly believed and asimilated in central Europe. This case has three main sources of proof, the texts of German Renaiscence Intellectuals, the existence of black legend narrative in Europe prior to the conquest of America, and the similarity of the stereotypes associated to judaism by anti-semitic Europe and those that the Black Legend attributed to the Spaniards. Texts identifying Spaniards with "heretics" and "Jews" can be found in Germany from the 14th century, and various pieces of 15th- and 16th-century anti-Spanish propaganda are almost line by line copies of prior anti-semitic works. For example, the famous account of the mistreated Native Americans killing their oppressors by pouring melted gold on their heads is an exact copy of the same scene in the anti-semitic poem the Siege of Jerusalem. It also suggests that the deep anti-semitism in Luther´s works may have served a double function, nationalistic and anti Spanish as well as religious, if that identification between both was already in circulation. An identification of Italy and Spain with the papacy, even though the Papacy and Spain were bitter enemies at the time. His own antisemitism and the long history coexistence-and intermarriage-of Christians and Jews in Iberia -the Spanish royal line was known to have Jewish blood in it. Luther characterized Spaniards as «sunt plerunque Marani, Mamalucken»; Jews, sons of Jews". Identification of Spain and Turkey, and fear to an invasion by both. Ideo prophetatum est Hispanos velle subigere Germaniam aut per se aut per alios, scilicet Turcam [...] Et ita Germania vexabitur et viribus ac bonis suis exhausta Hispanico regno subiugabitur. Eo tendit Sathan, quod Germaniam liberam perturbare tentat. —  Johann Fischart, Geschichtklitterung (1575). References to Spanish as "bad Christians", "Jews", "Moors" or racialized references associating said ancestry with lack of moral or general inferiority can be found uninterruptedly in black legend sources and political propaganda since the Middle Ages until well into the contemporary period. England played a crucial role in the spread and use of the Spanish Black Legend during colonial times, but it is also agreed that, no matter how much the English might have added to it, the origin of the narrative was not in England and actually reached the islands quite late in the game. This element has been highlighted by American Hispanist Philip Wayne Powell. He stated that the criticisms spread by the Jews expelled by the Catholic Monarchs of Spain have been considered an important part in the spread of anti Hispanic sentiment, especially when it comes to religious stereotypes. Those accounts tend to characterize Spain as godless, heathen and idolactric, as opposed to fanatically catholic like other German sources, but as usual those two things were not seen as mutually exclusive. Even though Jewish communities had already been expelled by almost all parts of Europe, including some of those who re-admitted them as a result of their feud with Spain, the level of criticism that the Sephardic Jews displayed was not seen regarding any other nation. Some of the explanations offered for this are that the Jewish community had never enjoyed such a golden period as they did in Spain, nor been so integrated, which made the expulsion more traumatic; that in other cases they were not so integrated in academic life; or that similar criticisms may have existed regarding other nations but found no amplifying mechanism in other parts of Europe and faded away, while the Sephardic Jews got enthusiastic listeners in Holland and the Netherlands. The active involvement of expelled Sephardic Jews, particularly of former intellectuals, in spreading a distorted image of Spanish religious practices has been supported by the studies of Yosef Kaplan, Yosef Hayim Yerushalmi and Jaime Contreras. In the process of European colonization of the Americas that lasted over three centuries, excesses were committed by all European nations according to both contemporary opinion and modern moral standards. Spain's colonization also involved some excesses, especially in the early years, following the arrival of Christopher Columbus in the Caribbean. However, Spain was the only colonial power and the first in recorded history to pass laws for the protection of indigenous peoples. As early as 1512, the Laws of Burgos regulated the behavior of Europeans in the New World forbidding the ill-treatment of indigenous people and limiting the power of encomenderos—landowners who received royal grants to recruit remunerated labor. The laws established a regulated regime of work, pay, provisioning, living quarters, hygiene, and care for the natives in a reasonably humanitarian spirit. The regulation prohibited the use of any form of punishment by the landowners and required that the huts and cabins of the Indians be built together with those of the Spanish. The laws also ordered that the natives be taught the Christian religion and outlawed bigamy. In July 1513, four more laws were added in what is known as Leyes Complementarias de Valladolid 1513, three related to Indian women and Indian children and another more related to Indian males. In 1542 the New Laws expanded, amended and corrected the previous body of laws in order to improve their application. This body of legislation represents one of the earliest examples of humanitarian laws of modern history. Although the laws of the Indies were not always followed, they reflect the conscience of the 16th century Spanish monarchy and its will to protect the rights of the native population. These laws came about in the early period of colonization, following some abuses reported by Spaniards themselves traveling with Columbus. Such reports led to an institutional debate in Spain about the colonization process and the rights and protection of indigenous peoples of the Americas. In 1552, the Dominican friar Bartolomé de las Casas published the controversial Brevísima relación de la destrucción de las Indias (A Short Account of the Destruction of the Indies), an account of supposed atrocities committed by landowners and some officials during the early period of colonization of New Spain, particularly in Hispaniola (today Haiti and the Dominican Republic). Las Casas, son of the merchant Pedro de las Casas who accompanied Columbus on his second voyage, described Columbus's treatment of the natives in his History of the Indies. The degree to which Las Casas's descriptions of Spanish excesses represent a reasonable or wildly exaggerated picture is still debated among scholars today. American historian Lewis Hanke considers Las Casas to have exaggerated the abuses described in his accounts and thereby contributed to Black Legend propaganda. Such exaggerations were used by writers of Spain's rivals as a convenient basis for attacks on Spain which would later be referred to as The Black Legend. They were already used in Flemish anti-Spanish propaganda during the Eighty Years' War. Historian Benjamin Keen on the other hand finds them likely to be more or less accurate. In Charles Gibson's 1964 monograph The Aztecs under Spanish Rule, the first comprehensive study of the documentary sources of relations between Indians and Spaniards in New Spain (colonial Mexico), he concludes that the Black Legend "flourishes in an atmosphere of indignation which removes the issue from the category of objective understanding. It is insufficient in its understanding of institutions of colonial history." This historical ill-treatment of Amerindians, also occurring in other European colonies in the Americas, was used as propaganda in works of competing European powers to create animosity against the Spanish Empire. The work of Las Casas was first cited in English with the 1583 publication The Spanish Colonie, or Brief Chronicle of the Actes and Gestes of the Spaniards in the West Indies, at a time when England was preparing for war against Spain in the Netherlands. The biased use of such works, including the distortion or exaggeration of their contents, is part of the anti-Spanish historical propaganda or Black Legend. From the perspective of history and the colonization of the Americas, all European powers that colonized the Americas, such as England, Portugal, the Netherlands and others, were guilty of the ill-treatment of indigenous peoples. Colonial powers have been also accused of genocide in Canada, the United States, and Australia. These issues have received greater scholarly attention over recent years and have led to and evolution in historiographical evaluations of the effects of colonialism. "At least three generations of scholarship have produced a more balanced appreciation of Spanish conduct in both the Old World and the New, while the dismal records of other imperial powers have received a more objective appraisal." Spain's war with the United Provinces and in particular the victories of the Duke of Alba contributed to the anti-Spanish propaganda. Sent in August 1567 to counter political unrest in a part of Europe where printing presses were a source of heterodox opinion, especially against the Roman Catholic Church, Alba took control of the book industry. Several printers were banished and at least one was executed. Book sellers and printers were prosecuted and arrested for publishing banned books, many of which were added to the Index Librorum Prohibitorum. After years of unrest in the Low Countries, the summer of 1567 saw renewed violent outbursts of iconoclasm, in which Dutch 'Beeldenstorm' Calvinists defaced statues and decorations of Catholic monasteries and churches. The Battle of Oosterweel in March 1567 was the first Spanish military response to these attacks, and a prelude to or the start of the Eighty Years' War. The 80 Years' War can be seen to have started on 13 March 1567 with the defeat of the rebels at Oosterweel. In 1568 Alba had prominent Dutch nobles executed on the Grote Markt in Brussels, sparking strong anti-Spanish sentiment. In October 1572, after the Orange forces captured the city of Mechelen, its lieutenant attempted to surrender when he was informed that a larger Spanish army was approaching. They tried to welcome the Duke's forces by the singing of psalms, but Fadrique Álvarez de Toledo, son of the Governor of the Netherlands, and commander of the Duke's troops, allowed his men three days of pillage of the archbishopric city. Alba reported to his king that "not a nail was left in the wall". A year later, magistrates still attempted to retrieve precious church belongings that Spanish soldiers had sold in other cities. This sack of Mechelen was the first of the Spanish Furies; several events remembered by that name occurred in the four or five years to come. In November and December of the same year, with permission by the Duke, Fadrique had many people of Zutphen and of Naarden locked and burnt in their church. Maastricht, the Netherlands, the Market Square. Spanish troops raiding the city in 1576. In July 1573, after half a year of siege, the city of Haarlem surrendered. Then the garrison's men (except for the German soldiers) were drowned or had their throats cut by the duke's troops, and eminent citizens were executed. In 1576, Spanish troops attacked and pillaged Antwerp. The soldiers rampaged through the city, killing and looting; they demanded money from citizens and burned the homes of those who refused to (or could not) pay. Christophe Plantin's printing establishment was threatened with destruction three times, but was saved each time when a ransom was paid. Antwerp was economically devastated by the attack. A thousand buildings were torched and as many as 18,000 men, women and children murdered. Maastricht was besieged, sacked and destroyed twice in succession (in 1576 and 1579) by the Tercios de Flandes (Flemish regiments). The siege of 1579 ended with the destruction and sacking of the city known as the Spanish Fury. During the assault they killed not only many of the town's defenders but also many women and children. The Spanish soldiers deliberately drowned hundreds of civilians by throwing them off the bridge leading over the river Maas. Of the city's population of 30,000, only 400 survived. The propaganda created by the Dutch Revolt during the struggle against the Spanish Crown can also be seen as part of the Black Legend. The depredations against the Indians that De las Casas had described, were compared to the depredations of Alba and his successors in the Netherlands. The Brevissima relacion was reprinted no less than 33 times between 1578 and 1648 in the Netherlands (more than in all other European countries combined). The Articles and Resolutions of the Spanish Inquisition to Invade and Impede the Netherlands imputed a conspiracy to the Holy Office to starve the Dutch population and exterminate its leading nobles, "as the Spanish had done in the Indies." Marnix of Sint-Aldegonde, a prominent propagandist for the cause of the rebels, regularly used references to alleged intentions on the part of Spain to "colonize" the Netherlands, for instance in his 1578 address to the German Diet. King Philip, at the time also king of Portugal, was accused of cruelty for his hanging of supporters of António, Prior of Crato, the rival contender for the throne of Portugal, on yardarms on the Azores islands following the Battle of Ponta Delgada. Other critics of Spain included Antonio Pérez, the fallen secretary of King Philip, who fled to France and England, where he published attacks on the Spanish monarchy under the title Relaciones (1594). The English referred to these books to justify privateering and wars against the Spanish. In the 18th century, despite the fact that he never visited Spain, philosopher Immanuel Kant stated that "The Spaniard's bad side is that he does not learn from foreigners; that he does not travel in order to get acquainted with other nations; that he is centuries behind in the sciences. He resists any reform; he is proud of not having to work; he is of a romantic quality of spirit, as the bullfight shows; he is cruel, as the former auto-da-fé shows; and he displays in his taste an origin that is partly non-European." Historian Walter Mignolo has argued that the Black Legend was closely tied to ideologies of race, both in the way that it used the Moorish history of Spain to depict Spaniards as racially tainted, and in the way that the treatment of Africans and Native Americans during Spanish colonial projects came to symbolize their moral character. In general, the existence of the Spanish Black Legend is accepted by academics, but the idea still faces some criticism and the consensus is not universal. Ricardo Garcia Carcel directly denies the existence of the Black Legend in his book The Black Legend (1991), arguing: "It is neither a legend, insofar as the negative opinions of Spain have genuine historical foundations, nor is it black, as the tone was never consistent nor uniform. Gray abounds, but the color of these opinions was always viewed in contrast [to what] we have called the white legend." Among the historians that actively support or have found proof in their work for the Spanish Black Legend we can name: Philip Wayne Powell, Edward Peters, William S.Maltby, Richard Kagan, Margaret R. Greer, Helen Rawlings, Ronnie Hsia, Lu Ann Homza, Stanley G. Payne, Andrea Donofrio, Irene Silverblatt, Christopher Schmidt-Nowara, Charles Gibson (historian), María Elvira Roca Barea, Ronald Hilton, Joseph Pérez, Bartolomé Bennasar and Sverker Arnoldsson, who specialized himself in the study of the subject. In other fields, such as musicology and sociology, proponents of this theory are Judith Etzion  and William Styron. The continuance, or not, of the Black Legend is a debated issue. In recent years a group of historians including Alfredo Alvar and Lourdes Mateo Bretos have argued that the Black Legend does not currently exist, it being merely the Spanish perception of how the world views Spain's legacy. Carmen Iglesias has argued that the Black Legend would consist of those negative traits that would be objectively the most repeated ones which the Spanish consciousness sees in itself. Nonetheless she admits that the Black Legend also responds to highly manipulated propaganda driven by political interests. Henry Kamen argues that the Black Legend existed during the 16th century but is now a thing of the past in England. Other authors, however, like Roca Barea and Philip Wayne Powell, argue that it still affects the way in which Spain is perceived and that it is brought up strategically during diplomatic conflicts of interest as well as in popular culture to hide the negative actions of other nations. Among those who consider that The Black Legend is still around, Roberto Fernandez Retamar, Benjamin Keen, Patricia Shaw, David J. Weber, and Eric Griffin have devoted work specifically to study the cause of its persistence. Creation and use of special categories: The use in English of the word "conquistador" instead of "conqueror" (the literal translation of conquistador), as well as of "conquista" instead of "conquest" (also, the literal translation of conquista) in order to create a new, unique category of connotation that separates both Spaniards from other Europeans, and the actions of the Spanish in the New World from the conquerors in Europe, even though both actions were not seen as different at the time. Direct references to constructs from the times of the Black Legend were made in British and Canadian press during the "Fletan War" of 1992 between both countries. This conflict was "solved" by diplomatic pressures partially generated by those black legend elements and never made it to international court. References to Black Legend constructs are currently used in Argentina to argue in favor of protectionist policies against Spanish companies. Latin America–United States relations: Powell considered it the root of current diplomatic problems and anti-Latino sentiment in the United States, and he shows so in his 1971 work The Tree of Hate: Propaganda and Prejudices Affecting Relations with the Hispanic World. The view of the Black Legend affecting the present-day United States' immigration policy has gained supporters in the current political climate. The narrative of the "degenerated race" is argued to be at the root of the racist discrimination suffered by Latinos in America. Spain's past ownership of about half of the United States' land is unknown by most Americans, affecting the way in which the Latin American population and culture are treated, as well as the linguistic debate there. Spanish foreign minister Josep Borrell explained that he sees a re-emergence of the Black Legend across Europe in the way the Catalonian issue has been covered, especially by English-speaking press, regarding the unquestioning acceptance of unchecked numbers of injured that turned out to be false. Spanish proponents of the prevalence of the Black Legend point out that the Black Legend view of Spain and Spanish history, as well as its anti-Catholic elements, are common in popular culture, such as in films like Elizabeth, whereas popular culture references to similar deeds by other colonial powers are scarce or idealized in movies such as Victoria & Abdul. In his essay Why Spaniards Make Good Bad Guys?, Samuel Amago analyzes the persistence of the Black Legend in contemporary European cinema through a long list of titles, actors and directors. In 2012, the British TV show Lonely Planet broadcast an episode about the Age of Discovery, in which Spanish, Portuguese, English, Dutch, and Turkish explorers were depicted. Only in the case of the Spaniards was any violent or negative action shown, devoting most of the time of the segment to how they killed and looted, while no mention was made of any such things by the English or Dutch, nor was the Portuguese slave trade shown. Additionally, none of the main exploration or scientific trips by Spain were shown. There was also no mention of the percentage of Native Population in each of the former colonies that could balance the lack of violence shown regarding central European nations. The Black Legend and its counterpart, the British golden legend, are allegedly main contributors to the construct of white supremacy, since they erase the ethical and intellectual contributions of Southern Europeans and reduce the power and competence achieved by indigenous empires prior to and during the Spanish conquest of the Americas. The label "White Legend" is used by some historians to describe a historiographic approach which they believe goes too far in trying to counter the Black Legend, and which consequently ends up painting an uncritical or idealized image of Spanish colonial practices. Such an approach has been described as characteristic of Nationalist Spanish historiography during the regime of Francisco Franco, which associated itself with the imperial past couched in positive terms. Some, such as Benjamin Keen, have criticized the works of John Fiske and Lewis Hanke as going too far towards idealizing Spanish history. The "White Legend" may also refer to the propaganda spread within Spain by Philip II and his descendants, to present his actions to preserve his own patrimony in the Netherlands and America as religiously motivated. This propaganda would create the view of a prudent and pious monarch within Spain, helping to control the unrest that his aggressive policies and wars in the Netherlands were generating. ^ a b Maltby, William B. "The Black Legend" in Encyclopedia of Latin American History and Culture, vol. 1, pp. 346-348. New York: Charles Scribner's Sons 1996. ^ http://www.fgbueno.es. "Emilia Pardo Bazán, La España de ayer y la de hoy (La muerte de una leyenda), 18 de Abril de 1899". filosofia.org. Retrieved 5 July 2016. ^ "el ambiente creado por los relatos fantásticos que acerca de nuestra patria han visto la luz pública en todos los países, las descripciones grotescas que se han hecho siempre del carácter de los españoles como individuos y colectividad, la negación o por lo menos la ignorancia sistemática de cuanto es favorable y hermoso en las diversas manifestaciones de la cultura y del arte, las acusaciones que en todo tiempo se han lanzado sobre España..."
^ Gibson, Charles. 1958. "The Colonial Period in Latin American History", pages 13-14, defines the black legend as "The accumulated tradition of propaganda and hispanophobia according to which Spanish imperialism is regarded as cruel, bigoted, exploitative and self-righteous in excess of reality"
^ Roca Barea, María Elvira (2016). Imperiofobia y leyenda negra. Roma, Rusia, Estados Unidos y el Imperio español. Madrid: Siruela. ISBN 978-84-16854233. ^ Marías, Julián (2006; primera edición 1985). España Inteligible. Razón Histórica de las Españas. Alianza Editorial. ISBN 84-206-7725-6. ^ Swart, K. W. (1975). "The Black Legend During the Eighty Years War." In Britain and the Netherlands (pp. 36-57). Springer Netherlands. ^ Arnoldsson, pp. 117 ss. ^ Arnoldsson, pp. 123 ss. ; Kamen, pp. 305 ss. ^ Luther op. cit., Tischr., III, p. 382, N° 3533 a (14-31 de enero de 1537); V, p. 284, N° 5635 a (12 de mayo de 1544): op. cit. Arnoldsson (1960). ^ "Mirror of the Cruel and Horrible Spanish Tyranny Perpetrated in the Netherlands, by the Tyrant, the Duke of Alba, and Other Commanders of King Philip II". World Digital Library. 1620. Retrieved 25 August 2013. ^ Stannard, David E. (1993). American Holocaust: The Conquest of the New World. Oxford University Press, USA. p. 74. ISBN 978-0-19-508557-0. ^ Keen, Benjamin (1969). "The Black Legend Revisited: Assumptions and Realities". The Hispanic American Historical Review. 49 (4): 703–19. doi:10.2307/2511162. JSTOR 2511162. ^ Arnade, Peter J. Beggars, iconoclasts, and civic patriots: the political culture of the Dutch Revolt. Cornell University Press, 2008 (Limited online by Google books). pp. 226–229. ISBN 978-0-8014-7496-5. Retrieved 31 July 2011. ^ a b c Elsen, Jean (February 2007). "De nood-en belegeringsmunten van de Nederlandse opstand tegen Filips II - Historisch kader" (PDF). Collection J.R. Lasser (New York). Nood- en belegeringsmunten, Deel II (in Dutch). Jean Elsen & ses Fils s.a., Brussels, Belgium. p. 4; 15. Archived from the original (PDF) on 18 January 2012. Retrieved 1 August 2011. ^ GDB (7 September 2004). "'Spaanse furie' terug thuis". journal Het Nieuwsblad, Belgium. Retrieved 31 July 2011. ^ pagan-live-style (2009–2011). "Catherine church Mechelen 3". deviantArt. Retrieved 3 August 2011. ^ "Sold Items provided for Reference and Research Purposes — OHN Bellingham - Assassin, St Petersburg, Russia, 3 December 1806 - ALS". Berryhill & Sturgeon, Ltd. Retrieved 3 August 2011. ^ "History - South-Limburg". Parkstad.com, Limburg, Netherlands. Archived from the original on 28 September 2011. Retrieved 3 August 2011. ^ Lamers, Jaqueline. "Gemeente Naarden – Keverdijk, diverse straten". Municipality of Naarden, Netherlands. Archived from the original on 27 September 2011. Retrieved 31 July 2011. ^ Mignolo, W. D. (2007). "What does the Black Legend Have to do with Race?" Rereading the Black Legend: The Discourses of Religious and Racial Difference in the Renaissance Empires, 312–24. ^ Etzion, Judith (1998). «Spanish music as perceived in western music historiography: a case of the black legend ?». International Review of the Aesthetics and Sociology of Music 2 (29). ^ Walsh, Anne L. (2007). Arturo Pérez-Reverte: narrative tricks and narrative strategies. Colección Támesis: Monografías (Volume 246). London: Tamesis Books. p. 117. ISBN 1-85566-150-0. Ardolino, Frank. Apocalypse and Armada in Kyd's Spanish Tragedy (Kirksville, Missouri: Sixteenth Century Studies, 1995). Díaz, María Elena (2004). "Beyond Tannenbaum". Law and History Review. 22 (2): 371–376. doi:10.2307/4141650. Edelmayer, Friedrich (2011). "The "Leyenda Negra" and the Circulation of Anti-Catholic and Anti-Spanish Prejudices". European History Online. Español Bouché, Luis, "Leyendas Negras: Vida y Obra de Julian Juderías", Junta de Castilla y Leon, 2007. Gibson, Charles. The Black Legend: Anti-Spanish Attitudes in the Old World and the New. 1971. Gledhill, John (1996). "Review: From "Others" to Actors: New Perspectives on Popular Political Cultures and National State Formation in Latin America". American Anthropologist. New Series. 98 (3): 630–633. doi:10.1525/aa.1996.98.3.02a00210. Griffin, Eric. "Ethos to Ethnos: Hispanizing 'the Spaniard' in the Old World and the New," The New Centennial Review, 2:1, 2002. Hadfield, Andrew. "Late Elizabethan Protestantism, Colonialism and the Fear of the Apocalypse," Reformation, 3, 1998. Hanke, Lewis. The Spanish Struggle for Justice in the Conquest of America. 1949. Hanke, Lewis. Bartolomé de Las Casas: Bookman, Scholar and Propagandist. 1952. Hauben, Paul J. (1977). "White Legend against Black: Nationalism and Enlightenment in a Spanish Context". The Americas. 34 (1): 1–19. doi:10.2307/980809. Hillgarth, J. N. (1985). "Spanish Historiography and Iberian Reality". History and Theory. 24 (1): 23–43. doi:10.2307/2504941. Keen, Benjamin. "The Black Legend Revisited: Assumptions and Realities", Hispanic American Historical Review 49, no. 4 (November 1969): 703–19. Keen, Benjamin. "The White Legend Revisited: A Reply to Professor Hanke's 'Modest Proposal,'" Hispanic American Historical Review 51, no. 2 (May 1971): 336–55. LaRosa, Michael (1992–1993). "Religion in a Changing Latin America: A Review". Journal of Interamerican Studies and World Affairs. 34 (4): 245–255. doi:10.2307/165811. Lock, Julian. "'How Many Tercios Has the Pope?' The Spanish War and the Sublimation of Elizabethan Anti-Popery," History, 81, 1996. Maltby, William S., The Black Legend in England. Duke University Press, Durham, 1971, ISBN 0-8223-0250-0. Maura, Juan Francisco. "La hispanofobia a través de algunos textos de la conquista de América: de la propaganda política a la frivolidad académica". Bulletin of Spanish Studies 83. 2 (2006): 213-240. Maura, Juan Francisco. "Cobardía, crueldad y oportunismo español: algunas consideraciones sobre la 'verdadera' historia de la conquista de la Nueva España". Lemir (Revista de literatura medieval y del Renacimiento) 7 (2003): 1-29. Mignolo, W. D. (2007). "What does the Black Legend Have to do with Race?" Rereading the Black Legend: The Discourses of Religious and Racial Difference in the Renaissance Empires, 312-24. Powell, Philip Wayne, Tree of Hate: Propaganda and Prejudices Affecting United States Relations with the Hispanic World. Basic Books, New York, 1971, ISBN 0-465-08750-7. Rabasa, José (1993). 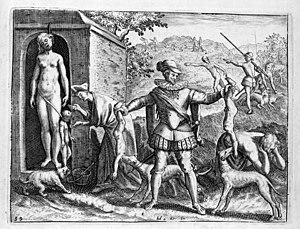 "Aesthetics of Colonial Violence: The Massacre of Acoma in Gaspar de Villagrá's "Historia de la Nueva México"". College Literature. 20 (3): 96–114. Vigil, Ralph H. (1994). "Review: Inequality and Ideology in Borderlands Historiography". Latin American Research Review. 29 (1): 155–171.